For the astronaut, see Jeffrey A. Hoffman. Jeffrey Robert Hoffman (born January 8, 1993) is an American professional baseball pitcher for the Colorado Rockies of Major League Baseball (MLB). He played college baseball for the East Carolina Pirates of East Carolina University. Named the best prospect in the Cape Cod Baseball League in 2013, he was expected to be among the top selections in the 2014 Major League Baseball Draft. The Toronto Blue Jays drafted him with the ninth overall selection. He was traded to the Rockies in the deal that sent Troy Tulowitzki to the Blue Jays in July 2015, and made his major league debut on August 20, 2016. Hoffman attended Shaker High School in Latham, New York, and played for their baseball team as a pitcher. In his junior year, he pitched to a 7–0 win–loss record. He struggled to be noticed by college baseball programs in the National Collegiate Athletic Association's Division I, as his fastball averaged 82 to 83 miles per hour (132–134 km/h). Hoffman pitched in Connie Mack Baseball during the offseason to attract attention from college programs, where his fastball improved to 92 miles per hour (148 km/h). This led to his signing a letter of intent with East Carolina University (ECU), a Division I school in Conference USA. He threw a shutout to lead Shaker in the championship game in 2011, his senior year. During his freshman year with the East Carolina Pirates baseball team in 2012, Hoffman started 10 of the 19 games in which he appeared, posting a 3–2 record, one save, a 3.67 earned run average (ERA), and struck out 55 batters in 72 2⁄3 innings pitched. East Carolina reached the National Collegiate Athletic Association Division I Baseball Tournament. That summer, Hoffman pitched for the Hyannis Harbor Hawks in the Cape Cod Baseball League (CCBL). During the 2013 season Hoffman was named to the All-Conference USA second team, after pitching to a 6–7 record, a 3.20 ERA, and leading the Pirates with 109 2⁄3 innings pitched and 84 strikeouts. He was added to the Golden Spikes Award watch list, and while pitching for Hyannis again in the summer, he was named the CCBL's top prospect. In his junior year at ECU, Hoffman went 3–3 with a 2.94 ERA before suffering a torn ulnar collateral ligament in his right elbow injury that required Tommy John surgery. Hoffman was considered to be one of the best prospects available in the 2014 Major League Baseball Draft, with the potential to be selected first overall, before his injury lowered his draft stock. The Toronto Blue Jays selected Hoffman in the first round, with the ninth overall selection, and he signed with Toronto on July 2 for the full bonus slot value of $3.1 million. Though unable to pitch, Hoffman was assigned to the Rookie Gulf Coast League Blue Jays for the 2014 season. He began throwing off a mound in February 2015, and made his professional debut with the Dunedin Blue Jays of the Advanced-A Florida State League on May 20. Hoffman's fastball reached 99 miles per hour (159 km/h) during his first start. After making 11 starts with Dunedin, the Blue Jays promoted Hoffman to the New Hampshire Fisher Cats of the Double-A Eastern League. He made his first start for New Hampshire on July 18, pitching a career-high 6 1⁄3 innings and allowing two earned runs..
On July 28, the Blue Jays traded Hoffman, José Reyes, Miguel Castro, and Jesus Tinoco, to the Colorado Rockies for Troy Tulowitzki and LaTroy Hawkins. Hoffman was assigned to the New Britain Rock Cats of the Eastern League following the trade. Hoffman began the 2016 season with the Albuquerque Isotopes of the Class AAA Pacific Coast League. He was selected to appear in the 2016 All-Star Futures Game. 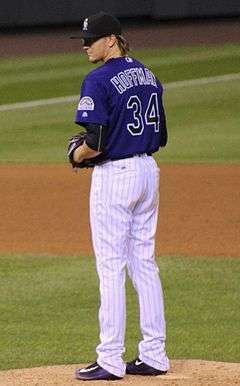 Hoffman made his major league debut for the Rockies on August 20. ↑ "Riding to college on their arms". Times Union. May 1, 2011. Retrieved August 30, 2013. ↑ "Hoffman pitches in". Times Union. June 3, 2011. Retrieved August 30, 2013. 1 2 "Jeff Hoffman Bio". ecupirates.com. Retrieved September 8, 2014. ↑ Allen, James (July 8, 2012). "Cape Cod ball has area flavor". Times Union. Retrieved August 30, 2013. ↑ ECU Media Relations. "Jeff Hoffman named to Golden Spikes watch list". WNCT. Retrieved August 30, 2013. ↑ ECU Media Relations. "Hoffman named CCBL Outstanding Pro Prospect". WNCT. Retrieved August 30, 2013. ↑ Axisa, Mike (May 7, 2014). "Report: Top draft prospect Jeff Hoffman needs Tommy John surgery". cbssports.com. Retrieved August 22, 2014. ↑ Mayo, Jonathan (May 24, 2013). "Date set for 2014 First-Year Player Draft | MLB.com: News". Mlb.mlb.com. Retrieved August 30, 2013. ↑ Nicholson-Smith, Ben (June 5, 2014). "Jays draft RHP Hoffman, C Pentecost in first round". Sportsnet. Retrieved June 5, 2014. ↑ Ross, Jaime (July 2, 2014). "Blue Jays sign first rounders Hoffman, Pentecost". MLB.com. Retrieved July 2, 2014. ↑ Dakers, Tom (July 2, 2014). "Blue Jays sign their first round draft picks". bluebirdbanter.com. Retrieved July 2, 2014. ↑ Nicholson-Smith, Ben (February 12, 2015). "Recovering Jays prospect Hoffman throwing again". Sportsnet. Retrieved February 12, 2015. ↑ Davidi, Shi (May 11, 2015). "Top Blue Jays prospect Hoffman set for pro debut". Sportsnet. Retrieved May 11, 2015. ↑ Seiner, Jake (May 20, 2015). "Blue Jays' Hoffman hits 99 in pro debut: 2014 first-rounder returns from Tommy John surgery with Dunedin". MiLB.com. Retrieved May 22, 2015. ↑ Nicholson-Smith, Ben (July 14, 2015). "Jays promoting top prospect Hoffman to double-A". Sportsnet. Retrieved July 14, 2015. ↑ "Fisher Cats Rally, Stun Sea Dogs 5-4 in 11". milb.com. July 18, 2015. Retrieved July 18, 2015. ↑ "Former ECU pitcher Hoffman traded to Rockies". witn.com. July 28, 2015. Retrieved July 29, 2015. ↑ "Colorado Rockies prospect Jeff Hoffman pitches six shutout innings in Triple-A debut for Albuquerque Isotopes". MiLB.com. April 9, 2016. Retrieved August 19, 2016. ↑ "Rockies prospects Jeff Hoffman, Raimel Tapia named to All-Star Futures Game". The Denver Post. June 28, 2016. Retrieved August 19, 2016. ↑ Saunders, Patrick (August 19, 2016). "Top prospect Jeff Hoffman to make Rockies pitching debut vs. Cubs". The Denver Post. Retrieved August 19, 2016.